*NOTE: Mandrill is undergoing major changes involving its relationship with Mailchimp. All instructions on this page are subject to change. If possible, we recommend integrating with a different ESP. Are you looking to integrate a Mandrill account with Outbound Automation by boberdoo? You’ve come to the right place. Mandrill is one most popular and cost-effective ESPs on the market and it even offers a free usage tier. Follow the steps below to properly configure and integrate your Mandrill account with Outbound Automation. If you already have a Mandrill account, skip to step 2. 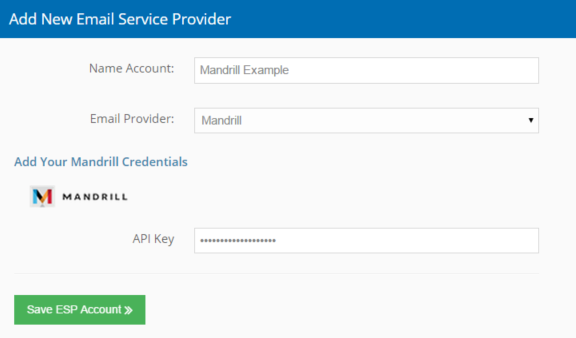 If you’d like to set up a new Mandrill account, click the link above. Fill in your account info, and you’ll be brought to the control panel and prompted for personal information. This is optional, but may help customize your experience to fit your needs. With this, your free account is ready to go. Your free account allows 2,000 trial e-mails, but will only send 25 emails/hour until your sending quota increases. Alternatively, you can upgrade your account at any time with pricing starting at $9.95/month. In order to send any emails from Mandrill (even a free account), you must first verify your sending domain. To do so, go to Settings>Domains in your Mandrill account. The domain you specified when setting up your account will appear in the table. If you would like to use a different domain to send from, add a new sending domain using the +Add tool. To verify your domain, you must first follow Mandrill’s instruction for setting the DKIM and SPF settings for your domain. Note: you can verify your sending domain without setting the SPF Setting, but it is recommend by Mandrill to do so. Once these are set, click the View details link in the Verified Domain column. This will allow you to send an email to an address using the domain you are looking to verify. Click the link in this email to verify your domain. Your next step is to enable click and open tracking within your Mandrill account. Go to Settings>Sending Defaults and make sure the Track Opens ckeckbox is checked and the Track Clicks dropdown is set to Both HTML and Text. Click Save. Finally, you can add an optional description for this Webhook. Click Create Webhook. Once complete, your webhook should be identical to the image below. You can also test your configuration by pressing the send test button. Your next step is to create an API Key, which you will use to integrate with Outbound Automation. Go to Settings>SMTP & API Info and click the + New API Key button. Add a description, leave each box unchecked and click Create API Key. Once created, ensure your key is switched to On and copy the key. Once you have your API key copied, head to Outbound Automation in your boberdoo system, and click on the Setup tab. From here, locate the Email Service Providers box and click the green Add New ESP button. Select Mandrill from the Email Provider dropdown and choose a name for your ESP. This name will be used for internal reference and organization only. Finally copy your API Key into the Api Key field. Once you’ve entered the API key, just click “Save ESP Account” and you’re all set! Your Mandrill account will now appear both in your Setup dashboard and as a sending option when building a campaign.